South African rock giants Prime Circle will be performing at Rumours Rock City for the very first time on the 8th December 2017. The band recently released their new album ‘If You Don’t You Never Will’ and will be showcasing new tracks along with their hits. 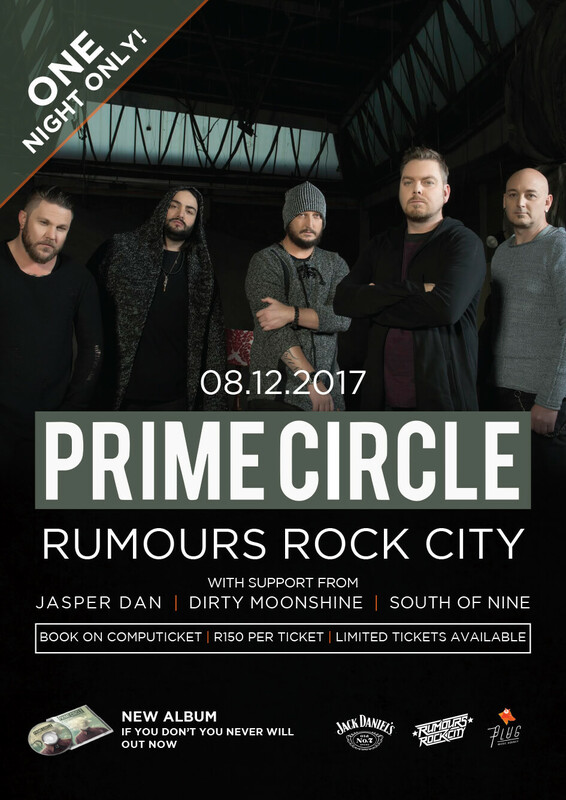 It’s been a long time since Prime Circle have played a club show in South Africa, and with support from whiskey-infused Jasper Dan, dirty rock ‘n rollers Dirty Moonshine and alternative rock act South Of Nine, this is set to be an evening of electrifying live music. There are limited tickets available so grab yours today! Rumours Rock City has become an institution on the South African live music circuit all thanks to the guidance of Fred Otto. ‘Rumours Rock City has been active for over a decade and we are proud of the artists that have taken the stage here and launched their careers with us. We are honoured to finally have Prime Circle perform at the venue as many of the artists and fans that frequent Rumours Rock City look up to them with great admiration. This is definitely a night not to miss. ’ says Otto. Prime Circle’s new album ‘If You Don’t You Never Will’ is available at all leading retailers.